Our 2018 grape season is inching closer to kicking off every day! Sufficient water over the winter months and unseasonably cool weather this spring look to have had a positive impact on quality; we’re already seeing significant size in our early red flame seedless grapes as noted by the picture to the right. However; the same growing environment seems to have pushed maturity back a few weeks versus last year. As a result, we see light volume throughout the month of July and perhaps into the first couple of weeks of August before volume starts to kick in. 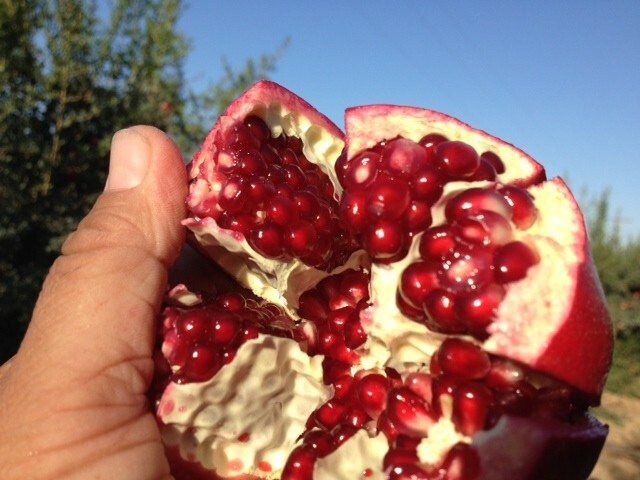 News UPDATE: Pomegranate Arils are still in season! Pomegranate arils are a great way to provide a snack that nourishes your family with every bite! Why should the California growing season limit your family to the benefits of fresh, ready to eat pomegranates? With Sweet Bursts, you can nourish your family every day of every month of the year! We have growers in Peru and Chile that grow the same great tasting Wonderful variety pomegranates that we grow here in California, so you never have to be out of Sweet Bursts. If you can’t find them, ask your grocer for Sweet Bursts. News: Our Domestic Pomegranate Crop is Underway! We’re now in full swing with our domestic pomegranate crop. First off the tree is our Rubilee. The Rubilee is a proprietary variety pomegranate with outstanding exterior color and super deep ruby red arils with high sugars. The Rubilee is available now and will take us well into August. We’ll move directly from our Rubilee pomegranates to the Smith variety followed by Early Wonderfuls. The Early Wonderful will be available until late September when the Wonderful variety starts. The Wonderful will take us through December. News: What Makes a Better Grape? On average, K5 Farms produces around 800 cartons of Flame Seedless Grapes per acre. That’s over 30% less than they could produce. In a time where having to produce more with less…More gross profit, more sales per labor hour, more sales per square foot, more cases per acre is the mantra of the day, it’s refreshing when the principle of doing things the way you believe should be done outweigh the need to produce more. Meet the Kovacevich family of K5 Farms, our most tenured grape grower. The Kovacevich family been growing grapes for over forty years, and they do know how to do things right. 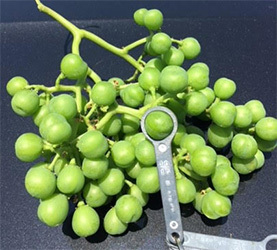 Take Flame Red Seedless Grapes; the typical industry standard is to produce 1,000 to 1,200 cartons of grapes per acre. The Kovacevich family believes that the key to producing the largest, sweetest, grapes with the highest nutritional value is to produce fewer cartons per acre. On average, K5 Farms produces around 800 cartons of Flame Seedless Grapes per acre. That’s over 30% less than they could produce. So they sacrifice quantity to produce quality. A better tasting, better looking, larger grape packed with lots of nutrition. That’s dedication to growing only the best…that’s more for your money. Trade publication, The Packer, has featured the expanding sales force at DJ Forry. Blend all together at medium speed. Makes 2 incredibly aromatic Summer Fruit Heroes Smoothies.